What Is a DD Form 214? DD Form 214, Certificate of Release or Discharge from Active Duty is a form issued by the Department of Defense (DoD) and provided to every veteran discharged, retired or separated from active duty in the Armed forces of the United States. The form - sometimes incorrectly referred to as the DA Form 214 - was last revised in August 2009. A sample copy is available for download below. A part of the retirement preparation process is completing a . This document is sent to the retiree, who has to complete and thoroughly check the form before submitting it to the person in charge. The document will not be given to the soldier until the actual separation date. A finalized DD Form 214 will be available on the day of discharge. The form first appeared in 1950 as a replacement of the old WD AGO Forms and NAVPERS documents. The early version of the form was called the Report of Separation from Active Duty. The present name was given on July 1, 1979, and remained unchanged since. How Do I Get My Dd Form 214? What Are Dd Form 214 Discharge Codes? The DD Form 214 is necessary for obtaining VA benefits, applying for new jobs, getting subsidized loans, enrolling in Veterans organizations, etc. The certificate is given out to each soldier on the day of discharge. A DD Form 215 can be used to correct any mistakes found on the certificate. The process of replacing a lost or stolen certificate by the veteran, authorized representative or next-of-kin takes three to four weeks. The simplest to request a copy of any of your military records is to visit the National Archives Website and file an online application. The SF Form 180, Request Pertaining to Military Records is used to facilitate the process both when filing digitally and sending requests by mail. Mail or fax a filled-out SF Form 180 to the National Personnel Records Center. The official address of the organization is 9700 Page Avenue St. Louis, MO 63132-5100, Fax: (314) 801-9049. Contact a Veterans Service Organization, the DoD, National Personnel Records Center, Federal Information Centers or Veteran Administration Offices for further information and assistance. If you experience any difficulties with obtaining the DD Form 214 by yourself, you can always hire a third party representative that will assist you with filing the required paperwork. To speed up the acquisition process and avoid any unnecessary delays make sure that all the required information is provided in full and all forms are signed and dated properly. Your application will be reviewed over the course of ten workdays. If requesting older records and forms that may have been lost to the 1973 fire at NPRC, be prepared to wait 6 months or longer. 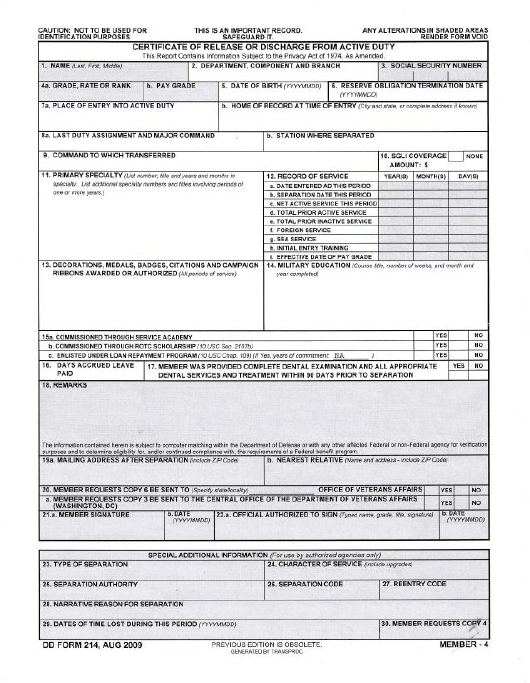 The DD 214 Form contains codes used by the DoD in order to denote the military retiree reenlistment eligibility and the reasons to discharge. These codes are called the SPN or discharge codes. The DoD prohibits the release of the meaning of the codes to the general public. There are many different interpretations online, but none of them are proven to be accurate or definite. Use the information available online at your own risk.